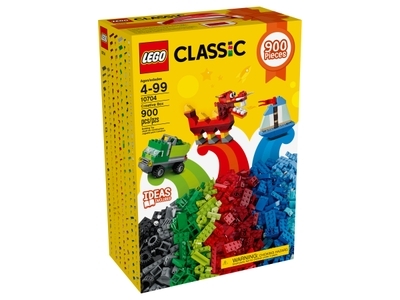 Set your imagination free with this exciting box of LEGO® Classic bricks, with an array of shapes and special elements in bright, vibrant colors. Create an endless world of fun as you bring your ideas to life. Build a world of cars, boats, buildings and creatures with over 890 pieces, including wheels, doors, windows and eyes. Dream it, build it and play it with LEGO Classic building sets! Price is 17% below the initial Lego retail price, a € 6.00 discount! This comes down to 3.22 cent per brick. The Creative Box (10704) Lego set is no longer directly available from the sites below. However, 3rd party partners of these sites might still have the set available. Alternate description Imagine and create with LEGO® Classic bricks!